Infeston had the most liked content! This would be great. I would be happy with this. I really hope that maybe Gutbusters or Ogors get a battletome, endless spells and maybe a new model? I would also be happy about BCR endless spells. Endless spells which reflect the nature of the Everwinter. We have all kinds of endless spell types (Fire, nature, light, shadow etc. ), but we don't have any ice or snow endless spells. So I can see them releasing snow/ice themed endless spells for BCR. I also have to defend the "whiny" people. Because I think, looking at the "whiny comments", nobody really "cried" or has voiced his opinion in a toxic or too negative way. I can also understand why many people think the preview was lackluster and boring. I don't care that much, because i got my Gloomspite Gitz at the beginning of the year and this will keep me interested and motivated for a long time. So I wasn't expecting too much. But there was also a point, where I was sad that Destruction didn't get anything cool. So I know how some people might feel. Most of the "negativity" were just statements, like "The preview was lackluster" or "I am disappointed by the preview". There were only a few, which got too negative (I think it might as well have been just one comment). I find the reactions towards the "negative" reactions more extreme than the actual "negative" reactions. In this thread I see people calling people "whiny" or "spoiled" just for voicing their opinion. I don't think that saying " I was disappointed" is a toxic or whiny way to voice your own opinion. It is just how it is for them: They were disappointed by the preview. I can understand this. I may not share the same sentiment, because I didn't expect anything, but I can sympathise with my fellow wargamers without thinking they are spoiled. I also have to add that I am playing Warhammer since 6. Edition. I don't know if this counts, because someone said you have to have played 5 years in order to voice your opinion. I also have to add that "Warcry" just seems to me like another small side game, which will be forgotten very fast. I am not a fan of games like this. But I may be wrong. To me it often seems like GW is starting too many different side-projects, but never finishes them or completes them. This results in a lot different small games, which often start with a cool concept, but are abandoned very early and you won't hear from them again. But this is also just my opinion. I am not trying to be "whiny" or "toxic". This is just how I feel about some of those side-games for AoS. Another question: What defines a Trogboss? If I want to build a Trogboss, could i theoretically use another head? So what I am getting at is the following: Does the weapon choice dictate which role a model has or does the face? So when I use a different face for the Trogboss, but the rest stays the same, could there be people who might complain that I haven't build a 100% Trogboss or will most people still count this as a Trogboss? I think this might be more of a general question about which features define the role of a model, because I have also build a Frostlord on Stonehorn without a beard (but he still has the frozen spear) and a Megaboss on Maw Krusha with a Gordrakk head (but still with the weapons of a Megaboss). I myself wouldn't think this could be a problem, but I just wanted to ask what other people think, because I have never been to a tournament or any other "official" or big event. So I don't know if something has to be build exactly the same way it is portrayed or if maybe some features (like heads) are interchangeable. Really? Maybe I mistake one head for something else. But I see one in the top sprue and two in the bottom sprue. But maybe I am wrong. Just wanted to be sure. I have another question. Does the Dankhold Troggoth have three head options? Looking at the sprues it seems to me like there are three head options. But I might be wrong. As we have seen only two options, I would be interested how the last option looks like, because I don't like the Trogboss head with the fish on the head (or whatever the thing on his head is). If there are three head options, does anyone maybe know if there exists pictures of all versions in the new battletome or somewhere else? I have another question. 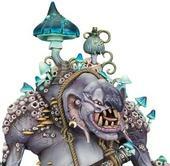 Does the Dankhold Troggoth have three head options? Looking at the sprues it seems to me like there are three head options. But I might be wrong. As we have seen only two options, I would be interested how the last option looks like, because I don't like the Trogboss head with the fish on the head (or whatever the thing on his head is). Edit: If there are three head options, does anyone maybe know if there exists pictures of all versions in the new battletome or somewhere else? Because they are new and shiny! I don't think the moon affects the battlefield when it is located in the corner of the battlefield, because of this: "The location of the Bad Moon determines which models are affected by its light. If the Bad Moon's location" is at the edge of the battlefield, its light does not affect any units" So the Bad Moon only affects units at the centre, in the middle or the other centre. So turn 2,3 and 4. Because of this Skargrott's ability to make the Moon move or make it stop becomes almost necessary for Gloomspite armies. 😄 Or maybe there are also special artifacts for Gloomspite heroes to maybe stop the moon or something like that? Will the Fungoid Cave Shaman still be available as an ally for all Destruction factions? The Gloomspite Gitz also can no longer ally with Ironjawz! Edit: Also I am a bit confused about the Bad Moon mechanic. Does the Bad Moon only travel in one direction and dissolves if he reaches the edge of the board or does he move back and forth? I thought maybe that the Bad Moon travels back if he reaches the other side of the board, because the arrow points backwards. Also another question: How does the mechanic work with 6 board tiles instead of the 4 tiles shown in the illustration?